THESE ARE OFFICIALLY OUT AND 370Z SPECIFIC. WE ARE YOUR LEADER IN KW!!! 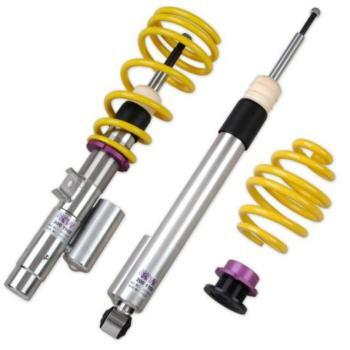 * Unique, independently functioning damping power adjustment"
As many of you know us from your previous G35's and Z's, we have always recomended KW Coilovers. Now, finally, they are out for the 370z and I couldnt be any happier. We already have a set thats going on our 370z Specifically as KW's are absolutely amazing! They are killer on the track and street driving is smooth sailing. Made 100% in Germany and imported into the US, these have been an UBER popular line with the BMW guys for years, and their quality never ceases to amaze me. They are in stock now and ready to ship . Contact Luke for best price! Last edited by THMotorsports; 06-24-2015 at 10:25 AM. I use KW V3 on my MINI. They are by far the best coilovers I have experienced. So tunable! Also, with KW you get very, very good technical support from people who know a lot about spring and damper selection and setup. I give them my highest recommendation. also are the g37 stuff good on 370z ??? These are from the G37, but it will be confirmed in about 1 week if they fit 100%. I will send quotes then. any updates on if these are for the 370Z ?? Any answer of if these fit the 370? Just called KW and they are bringing in a 370z this week. Once everything is tested to make a proper fit, they will be confirmed and released! Last edited by THMotorsports; 01-27-2009 at 12:14 PM. any idea when you'll be finding out? Cant wait to see the first one slammed!!!! Im ready to order man im waiting on confirmation! We will have confirmation next week. Basically, since we are doing the development of the SPC ARms for the G37 and 370z, we noticed that they are nearly identical. KW Also is pretty sure the kits are identical BUT, wants to make sure. For those who want, put down a $100 deposit to sales@thmotorsports.com via paypal to ensure your set! ok KW, just a few more days!